The Dutchman will return home after an injury-hit season in Scotland. Danny Buijs has announced he won’t extend his stay with Kilmarnock, instead opting to return to his native Holland at the end of the season. The 30-year-old joined Kenny Shiels’ men on a one-year deal last year but a succession of injuries ensured he only made 17 appearances for the Ayrshire club. Former Feyenoord man Buijs has played since being forced off after only 20 minutes of the club’s League Cup final win over Celtic in March. 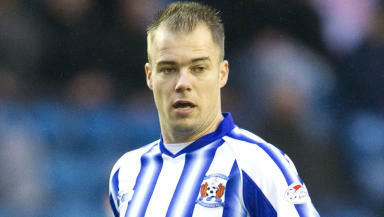 Despite enjoying his time in Scotland the Dutchman has informed the Rugby Park side he intends to move on. He told national newspapers: “I’ve told the chairman and manager that I will be going back to the Netherlands. I signed for one-year, so I am out of contract. It was a difficult decision because I have enjoyed my time here. “Life in Scotland has been good, I have two sons who go to school here and they really enjoy it. “But, on the other side, it has been a difficult season for me because I’ve struggled with injuries and that’s been disappointing. Killie are also set to miss out on Altrincham striker Damian Reeves. Kenny Shiels had watched the 26-year-old in action earlier this season but the attacker is expected to stay in England with Oldham Athletic a possible destination.